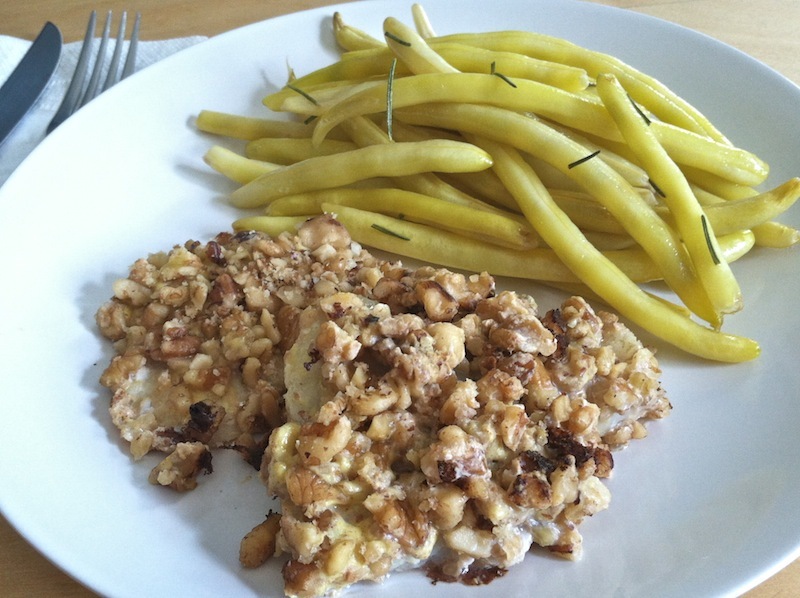 Walnut-Crusted Fish | Keep It Up, David! I have a quickie recipe for you today. I didn’t take many pictures, partly because I was dealing with raw fish and didn’t want to touch my camera, and partly because I didn’t really know how this was going to turn out. It turned out well, though, and I wish I had more photos, but I don’t, so we’re all just going to have to deal. 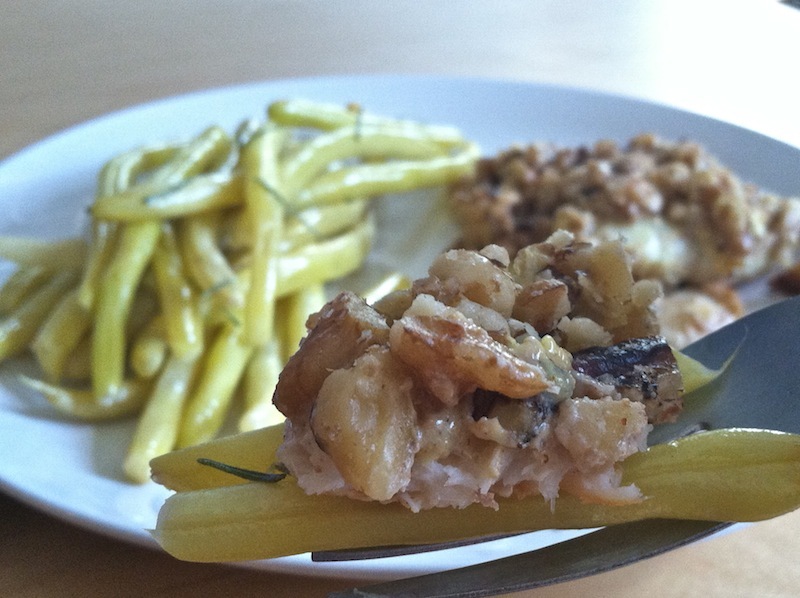 Here’s how to make a simple Walnut-Crusted Fish. I used flounder, but use tilapia, salmon, or whatever fish you’d like. This is a recipe for one (yay bachelor life! ), so adjust measurements accordingly to feed your brood. In a shallow bowl, mix 1 tablespoon lite mayo with 1 tablespoon spicy brown mustard (or Dijon, if you’d prefer). In another shallow bowl, chop up walnuts into small pieces. I used about 1/3 cup. Slick a skillet with Pam and put it on medium heat. When it’s hot, lay the fish pieces fish side down, walnut-side up and don’t touch them. Just let them go about 5-6 minutes, until the fish is fully cooked (my fish was thin, if your fish is thick, then it may need more time). I made a side dish of yellow wax beans. At first I thought I’d saute them, but they didn’t seem to be cooking, so I added about 1/2 cup of water to their skillet, threw on a lid, and steamed them with rosemary. The walnut crust is thicker than the fish! The walnuts of course added crunch, but the layer of mustard and mayo added some creaminess and flavor. Easy, healthy, and delicious = a perfect lunch. It made my morning. 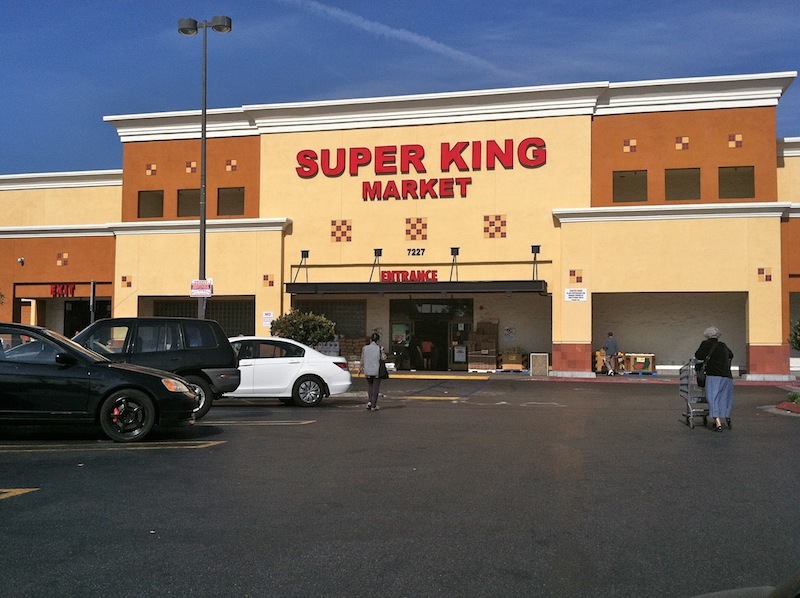 Super King is a local chain of grocery stores with only a handful of locations. They have the best produce prices I’ve ever seen. A few years ago, Super King was a regular feature on this blog. I wrote about buying an entire bag of produce for under 11 dollars. I wrote about buying nine pieces of fruit for $1.65. I shared funny photos of their terribly misspelled signs. That Super King location was way over in a different part of town, but at the time, I was over there once a week for a class I was taking, so it was no big deal to swing by and stock up on fruits and veggies. I haven’t been to Super King since I stopped going to that class. This Super King – which apparently opened last summer and why didn’t anyone tell me? – isn’t exactly around the corner, but it’s much closer. I didn’t have time yesterday to go in and check it out, but I soon will. This entry was posted on Wednesday, May 7th, 2014 at 12:01 am and is filed under Uncategorized. You can follow any responses to this entry through the RSS 2.0 feed. You can leave a response, or trackback from your own site.